If you long for adventure, something to make our hearts beat faster. something you would love to do, really want to do, do it soon, while you still can. This is for you. 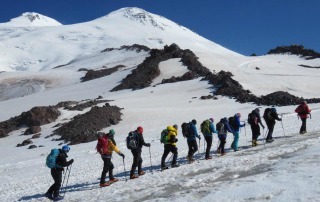 Why Senior Trekking Mount Elbrus? I climbed Kilimanjaro in 2012, and trekked to Everest base camp in 2013. 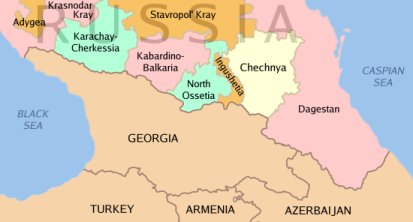 I went to Russia in July 2015, to attempt to climb Europe’s highest mountain, Mt Elbrus, in the central section of the Caucasus Mountain range, close to the Georgian border. It was by far the hardest of my three senior trekking expeditions. Climbing and moving on snow and ice requires a good level of fitness, and basic alpine skills such as safe use of ice axe and crampons, harness and rope techniques, handling a slip, and working in a team. The route to the summit involves a long and strenuous trek, which can be dangerous. The altitude 5642m, unpredictable weather, with frequent violent storms, poor visibility, and low temperature can transform the ascent into a real high altitude adventure. 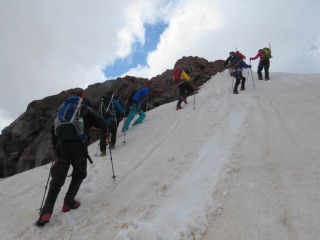 The first two days were altitude acclimatisation treks on neighbouring peaks, below the snow line. The Russian soldiers on Mt Cheget barely acknowledged our presence as we took a wobbly chairlift to 2700 meters, and trekked a further 450 meters to a high point of 3150 meters, stopping at the Georgian border for a team photo. The next day was a testing trek of 1350 meters to an altitude of 3350 meters, to the Terskol Astronomical Observatory. To begin with we walked through forests and flower covered alpine meadows. It was a long day, in hot weather, and soon after my return to our hotel I became ill, feeling nauseous followed by severe vomiting, which lasted several hours. I slept fitfully that night and next morning we took the ski gondola to the Mirr station at an altitude of 3500 meters. From there we trekked to 4050 meters. We returned to Cheget village, and were now ready to make our home on Elbrus for the following five days. 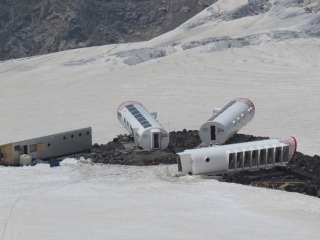 Our mountain base was the LeapRus cabins at an altitude of 3900 meters. We got there via gondolas, chairlift, and Ratrack/Snowcat. In a few minutes of ascent we were taken from the warm Alpine foothills of Azau village to the chill Arctic conditions of snow and ice. This was our base camp for the following five days. The eco-friendly LeapRus cabins have cutting edge technologies for heating, lighting, water recycling from melting snow, and waste disposal. The panoramic views from the dining room would rival that of a five star hotel anywhere in the world. In the afternoon we practiced alpine skills with crampons, ice axe, and fixed rope techniques. Also, we were shown methods for moving on ice and snow both for ascending and descending. Day 5 was a good test as to how well we were acclimatising, rising at 6am to trek to Pastukhov Rocks at 4750 meters. One of our team got ill about 100 meters from our target altitude and had to return to LeapRus with our leader, Pat Falvey, one of Irelands great adventurers. Some of the team found that last 100 meters very challenging. Day 6 was our final acclimatisation trek before the summit attempt, and I was feeling strong. The daily walks were getting progressively more difficult, and this was the hardest trek to date, reaching an altitude of 5100 meters, in temperatures of -22 degrees, just before the long traverse under the east summit of Elbrus. Myself and another member of our team took an exhilarating high speed snow mobile ride down 1200 meters to our base at LeapRus. I did this for the fun and novelty, but also because I was exhausted! That evening I told The leader Pat Falvey that ‘my race was run’ and I would not be joining the team in the final trek to the summit at 5462 meters. This was a well thought out decision, and whilst there was a degree of disappointment, in a way it only served to highlight what I had already accomplished in going beyond anything I had previously achieved on the mountains. That last 542m would be infinitely more difficult that an equivalent height from sea level. Day 7 was a team rest day, with some activities, i.e. practicing snow and ice skills. It was colder than other days, but blue skies and sunshine brightened my mood. Ironically this was one of my best day’s health wise. The fact that the hard work of the expedition was over probably contributed to my feeling of wellbeing. The team were resolute and positive, despite the noticeable affects of altitude among several of them. I had no doubt, that barring adverse weather conditions, which are a constant risk on Elbrus, they were ready for the summit. Day 8 Eight brave mountaineers rose at 1.30am to begin their preparation for the trek to the summit. They took the Snowcat to 5100 meters, an altitude they were already acclimatised to, from where they began the arduous trek to 5642 meters. Of course I was a little envious, yet had no regret about my decision. 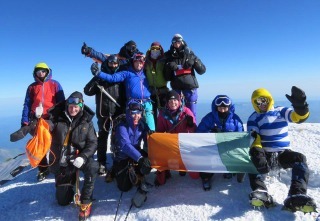 They reached the summit at 7:30 am, making very good time in favourable weather conditions. 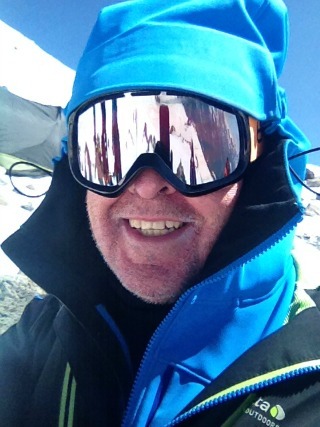 I was delighted to have reached an altitude of 5100 meters, 300 meters higher than Mont Blanc! 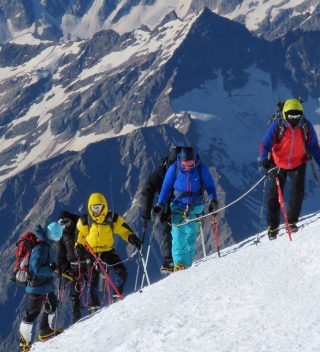 In truth everyday had been a ‘summit’ for me because in Senior Trekking Mount Elbrus I had experienced a higher level of challenge than heretofore. What are some of your Retirement Wishes, before you ‘kick the bucket’? •	Things you want to do? •	Places you want to visit? •	People you want to be with? Do you have some pictures to accompany your Bucket List? Click the button and find the first one on your computer. Select it, and click on the button to choose it.